MANSFIELD, Mass. – Wednesday night’s Div. 1 South preliminary round matchup started with a spell of pressure from the visiting team, as Nauset put Mansfield on its heels for the first minute or two and earned the game’s first penalty corner. The remaining 58 minutes were completely dominated by the Hornets, last year’s D1 South finalists. Mansfield rolled to a 5-0 win at Alumni Field with five different players getting on the score sheet and the Hornets forcing Nauset goalie Lucy McNamara to make 19 saves (14 in the first half alone). McNamara was forced into action early and often by the Hornets. Emily Ierardo started the onslaught in the third minute with a point-blank chance that the goalie kicked aside. Three minutes later Caitlin Whitman had a shot off a corner that was saved and three minutes after that it was Olivia Horn who had not one but two shots kicked away. Another penalty corner in the 12th minute saw McNamara make another stop on Ann Maher’s blast from the edge of the circle and, despite the goalie’s heroics, it felt like the breakthrough was imminent. The opening goal came on a rebound as Ierardo had another chance from close range denied but the ball skidded out to Amalia Todesco and the senior hit a low shot through traffic to make it 1-0. McNamara was forced to stand on her head to keep the Hornets at bay and she denied Horn again in the 18th minute with a diving save then dove back across goal to make a second stop. Mansfield kept pressing and a third shot hit a foot of a defender on the line to give the Hornet a penalty stroke that Whitman coolly put away to double the lead. The scoring opportunities kept coming for Mansfield, which forced 10 penalty corners in the opening half (to just three for Nauset) and saw goalie Molly Norton spend almost the entire 60 minutes as a spectator with little to do. Nauset defender Madison Morris cleared a pair of chances off the line with seven minutes to go until halftime and McNamara closed the first half with a flurry, making stops on shots by Mariana Palanza and Heather D’Ambra. Any hope for Nauset was extinguished early in the second half when Mansfield tacked on a third goal just two minutes after the break. Kristina O’Connell played a ball into the crease that was tipped by Ierardo but saved by McNamara. The ball broke kindly for Palanza, who stepped up and tipped it into the empty net. That plan continued in the 40th minute when Todesco ripped a shot from the right side and O’Connell turned it in at the near post with a clever deflection. In the 57th minute, Mansfield sealed the big win by adding a fifth, Mairead Dunn stepping up from her defensive position and firing a low shot through legs in front and into the bottom corner. With the win, 13th-seed Mansfield (13-4-2) will travel to face No. 4 seed Sandwich on Friday afternoon in the first round. NORTH EASTON, Mass. – A biting wind was whipping across Muscato Stadium on Wednesday evening and blowing a cold mist around the field. Rather than having her team sit in the weather waiting for the start of the varsity game, first-year Oliver Ames coach Abby Tepper moved the Tigers inside to warm up. Whatever happened prior to the start of the game, once the whistle blew the Tigers were fired up and raced out to a 3-0 lead inside the first eight minutes. Junior Elizabeth Nuss scored two goals in that stretch and added a third with nine minutes remaining to clinch a 6-4 victory for the Tigers over division rival Mansfield. Nuss was right on the pads of Mansfield goalie Molly Norton (six saves) just two minutes in to tap in a rebound after Norton saved two shots from the Tigers. Just two minutes later and Nuss scored from further away as her shot from the right side slipped through a traffic jam in front of goal and found the back of the net. 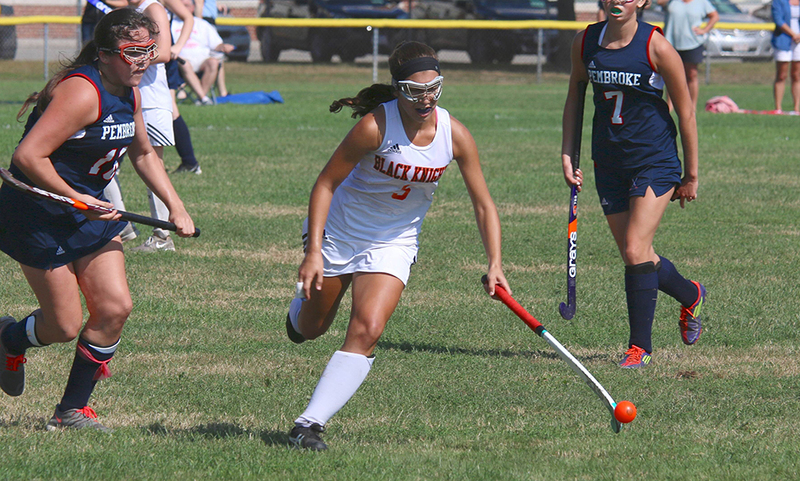 OA added a third in the eight minute when Sarah Stevens teed up Dimitra efremidis at the edge of the circle off a penalty corner. The senior buried the chance and forced the Hornets to take an early timeout. 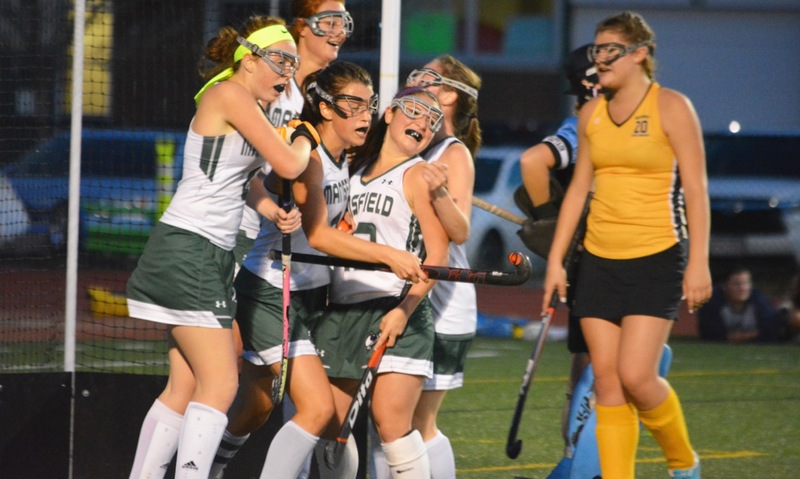 “They came out strong, but actually we did too,” said Mansfield coach Theresa Nyhan. “The difference was the way they positioned the player in front of the goalie. It kind of threw us for a loop. Katherine Vamosi made six of her nine saves in the first half and denied several Mansfield chances, but in the 13th minute the Hornets got on the board. Jill Hobaica was in the right place in front of goal to tip home a centering pass from Caitlin Whitman. The momentum only lasted four minutes before OA answered back on another long-range shot from Efremidis that snuck through a tangle of legs in front to make it 4-1. With the lead, OA started to sit back a little deeper and Mansfield took advantage to get back into the game. A ball knocked in from the edge of the circle was tipped by Heather D’Amrab and flicked over the goalie’s pads by sophomore Maggie Danehy. Three minutes later and the lead was cut to just one when Whitman’s cross was redirected by Danehy into the path of Emily Ierardo at the back stick to tap in. The scoring was not done with Sydney Hedrickredirecting Cristina Boudreau’s near post cross to widen the gap to two goals. Vamosi came up with a big sliding stop on Olivia Horn in the final seconds of the half to keep it 5-3. The Hornets did come out of the break with renewed energy and eight minutes into the second half had cut the lead back to one. Ierardo was denied on a penalty corner by a point-blank save, but Mansfield kept the pressure up and Horn’s shot rebounded to the stick of Kristina O’Connell to make it 5-4. OA did not sit back on the lead but continued to counter quickly and had several chances on the break. The Hornets continued to pressure and create openings in an entertaining end-to-end half. 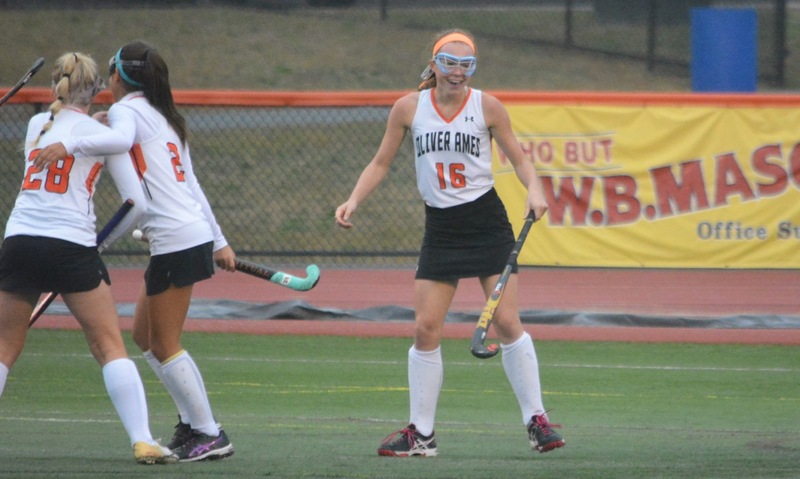 With the Hornets chasing the tying goal, the Tigers were able to strike and put the game away. Efremidis had a restart on the left side and it was tipped Boudreau into the path of Nuss to close out her hat trick and seal the win. Oliver Ames (6-0-3, 5-0-3) will try to keep the momentum going against Milford on Friday before having a week to prepare for the visit of Tepper’s alma mater, Foxboro. Mansfield (4-3-1, 4-3-1) will try to bounce back on the grass at Sharon on Friday. NORTH EASTON, Mass. – The numbers game finally caught up to Mansfield. In a 1-1 game, the Hornets controlled the first five minutes of overtime in the D1 South Final, pushing the pace and getting into attacking positions but never found an opportunity to bury the game winner. Walpole used the counter attack, first a breakaway from Emma Flynn that Mansfield goalie Brenna Prior denied point blank. Then a minute later, the Porkers got a two on none chance when Brooke Skulski net Abigail O’Sullivan in for a chance but once again Prior got the stop. 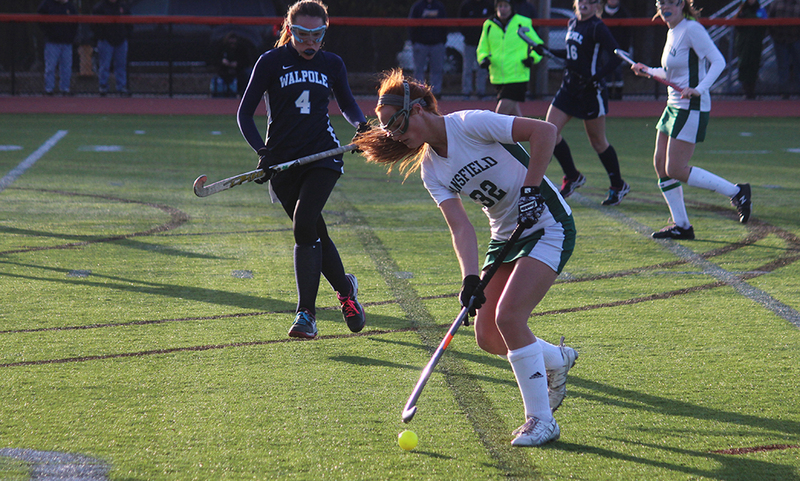 But just one minute later, the Porkers had a three on none breakaway chance with Mansfield trying to sub and off a counter attack and Prior had no chance when Mel Weber slipped a pass to her right to Celia Walsh for the tap in as Walpole got a 2-1 win in overtime. 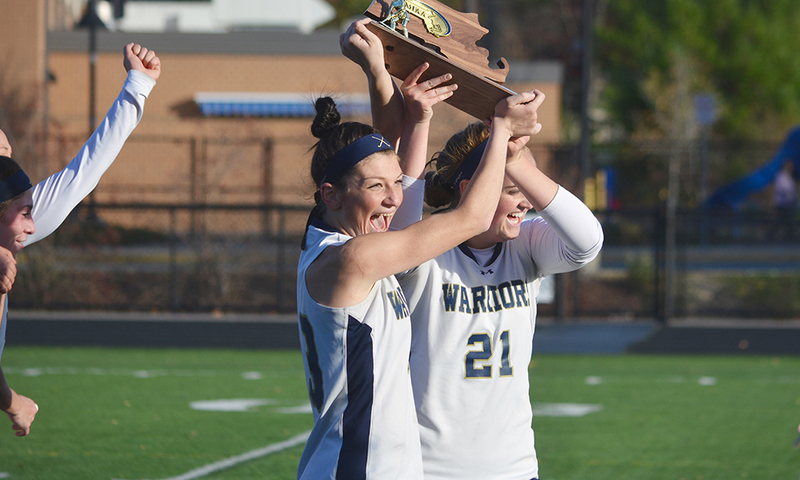 Mansfield took the lead after weathering an early push from Walpole in the first 10 minutes. The Hornets were finally able to get some pressure going forward and after a restart, Amalia Todesco ripped a shot into the area and the rebound fell to senior Caroline Maher and she buried it while falling to give Mansfield a 1-0 lead just 13 minutes into the game. The Hornets nearly doubled the lead when sophomore Emily Ierardo beat her mark down the right sideline and cut in. She fired a cross that Maher got a good piece of by Walpole goalie Audrey Lynch got her pad in the way to stop the shot. mansfield was able to kill off a green card penalty to end the first half. After a back and forth start to the second half, the Porkers were able to break through with just over 18 minutes to play. Weber charged down the middle and a rebound fell right to Walsh and she buried it to tie the game. Walpole nearly had the winner with just over six minutes to play when Prior was beat but Maggie Dunn did well to cover the goal and stopped a shot right on the goal line. In overtime, Mansfield controlled possession for almost all of the first five minutes but failed to register a decent scoring shot. Prior made two huge saves to extend the game before the Porkers finally scored with just over seven minutes to go in the second overtime. Mansfield finishes the season 20-2 overall and won the Kelley-Rex division for the second year in a row. It’s the first time the Hornets have won consecutive league titles since 1997 and 1998 that the program has done so.